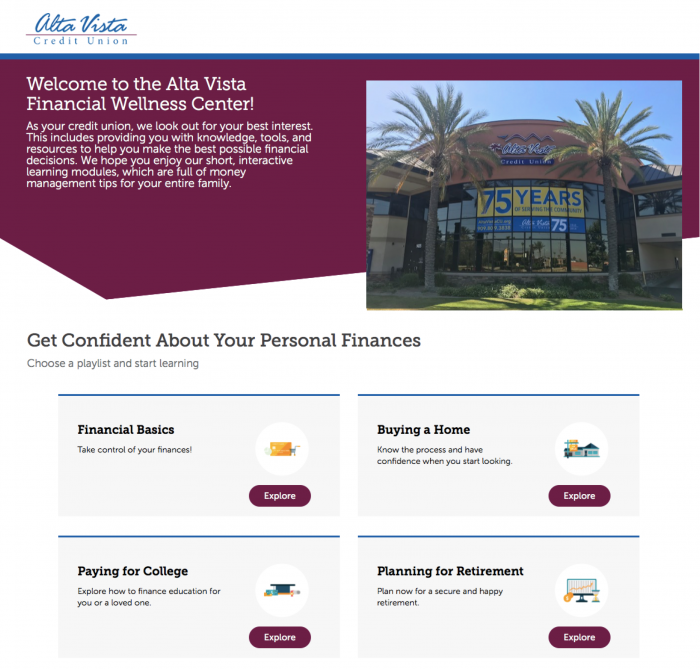 REDLANDS, CA (September 14, 2018) — Alta Vista Credit Union announced today the launch of an interactive, online financial education initiative through their new partnership with the nation’s leading education technology innovator, EVERFI, Inc. Alta Vista Financial Wellness Center is available as a complimentary resource to help members of Alta Vista Credit Union and the surrounding communities learn how to better manage their finances and plan for the future. “Alta Vista Credit Union is committed to promoting financial literacy in the communities that we serve. We’re here to help our members understand how to save, earn, borrow, invest and protect their money wisely. As we look out for our members’ best interest, we also want to help them develop short and longterm financial habits and skills that lead to greater financial well-being,” said RaAnn Wood, President and Chief Executive Officer at Alta Vista Credit Union. According to Wharton, 70% of Americans could not correctly answer three basic financial literacy questions. Alta Vista Credit Union is committed to empowering families/individuals/their community members with the skills they need to change this trend and thrive financially. Alta Vista Financial Wellness Center offers an assortment of adult financial education learning topics, with subjects including building emergency savings, mortgage education and retirement planning. Each learning topic is 3-10 minutes in length and is designed to encourage participants to build financial confidence via a series of interactive activities. The mobile and tablet-friendly program is available in English and Spanish. “As a trusted partner and leader with nearly a decade of experience providing financial education for learners of all ages, EVERFI believes that financial capability is and must be within reach for all consumers and communities, regardless of their financial means, “ said EVERFI Co-Founder and President of Financial Education, Ray Martinez. To learn more about the program, visit https://altavistacu.everfi-next.net. Headquartered in Redlands, CA, Alta Vista Credit Union is a member-owned financial cooperative opened in 1943. The credit union serves 14,500 members and offers a full line of financial products and services. Membership is open to anyone who lives, worships or works in San Bernardino County or Riverside County, California.